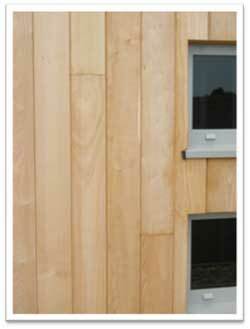 For vertical cladding, tongued and grooved boards with limited widths are frequently applied to the timber frame so that moisture movement does not disengage the tongues. Another way of doing it is using rebated board that has a flush surface with enough of an overlap to allow the boards to shrink. 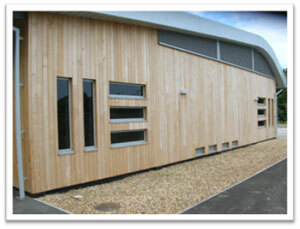 Open joints can be used with this type of cladding but more rain will go through the joints than on horizontal open joints. UV light does have the potential to have an effect upon the membrane of the cladding so it is a good idea to check with the manufacturer of the membrane to find out the effects. Board-on-board is the simplest form of vertical cladding consisting of spacing out boards on the inner level and the covering the gaps with an outer layer of boards. A variety of surface modelling can be achieved by making the widths of the boards’ variable in each layer. Simple rectangular boards can be used but on the outer layer the boards may be different so that the modelling of the surface becomes accentuated. This style of cladding is exceptionally tolerant of dimensional variation as well being suited to curves in the design but narrower boards are useful for when the curve has a tight radius. If you do use boards vertically you may want to consider not only the length of the boards but also on multi-story buildings using horizontal cladding for the ground floor. This is because if you have vertical cladding all of the way then you might find that the lower parts of the wood will swell if water gets in through the grain. The horizontal boards will also provide a good base structure to the cladding and will allow for any creep or settlement of the building.